Whenever the words carpet tiles are mentioned you instantly imagine this product being laid in a commercial setting, as historically this is where they've always been used. Every business is looking for a heavy duty, hard wearing solution to cover their floor regardless of whether it's a shop, showroom, office or public building. These types of environments are typically subject to high levels of traffic, for example, from vehicles, chairs or pedestrian footfall. Catering for these areas and then finding a carpet tile that not only fits the bill, but is also durable, decent quality and looks good can be tough. From experience, every business regardless of size will normally have a budget in mind when starting their new build or refurbishment project. Depending on how the job goes budgets may get pressured even further as the work draws to a close. Generally, carpeting/flooring are the last products to be fitted so with funds now either very low or near to being depleted every penny counts. That's when it becomes even more essential to find a hard wearing, quality product that's not only the right colour and price but one which is in stock and ready for immediate dispatch. This is where Carpet Tiles Next Day can really help; we can guide customers through the process of choosing commercial carpet tiles that will work in their own everyday situations and more importantly tiles that won't break the bank either. 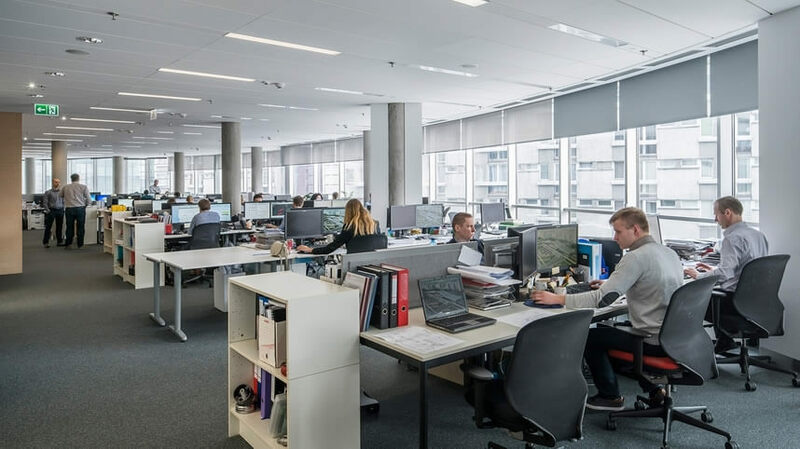 Every office is different, however, one thing they all have in common is that they need a practical hard wearing floor covering that will stand up to the continuous use they face from a busy workplace. From coffee stains to water coolers, to receptions areas, call centres, distribution warehouses or even schools, all working environments are subjected to some real heavy wear and tear on a daily basis. Many businesses, ours included may even have multiple uses for certain rooms, with a varying number of staff or general public to contend with too. A good quality carpet tile will handle all of this but you have to choose carefully to avoid some issues that may occur at a later date. 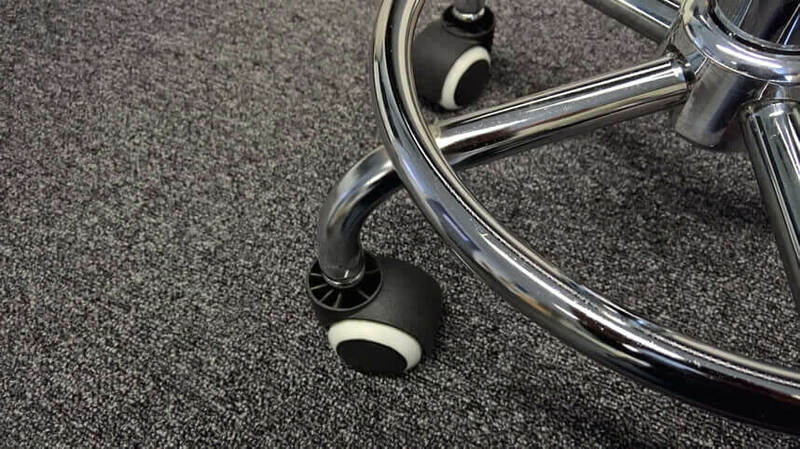 One thing to point out first with office carpet tiles is that not all are approved or rated for use with castor chairs (chairs with wheels). This might seem strange given most modern offices these days will have some chairs that will undoubtedly have castors on. The budget, low cost polypropylene carpet tiles are normally the ones which can fall into this category. Don't be put off by using these though as not all areas in the workplace will need to have the castor specification. We have low cost, budget carpet tiles here and sell thousands every day to business customers for lots of different spaces which are not rated for use with castor wheels. It's probably worth explaining at this point that if you use a budget tile which is not certified for use with castors under chairs then what can happen is that the pile will flatten over time and the carpet tile could possibly even curl as the pile crushes and distorts. There are several options available to combat this so if you have a large area to cover and want to keep costs to a minimum this carpet tile could still be right for you. You could always purchase some clear poly-carbonate chair mats from day one and place directly under where the chairs roll or you could, at point of order simply buy a few more carpet tiles and replace the tired ones as and when required in the future. Carpet tiles which are rated for use with castors have been thoroughly put through their paces in a manufacturers' laboratory or testing facility and based on these results the relevant passes given for each qualifying test. Normally a tile made using nylon fibre will come out on top as the yarn is naturally much softer and is generally categorised as heavy contract and passes the castor chair test. The softer pile helps it to bend and flex under stress but bounces back to its original state after the pressure from chairs or feet is released. This helps them to keep their appearance for longer compared to other types of fibre. A nylon carpet tile will cost a little more than their polypropylene counterpart but you have to weigh up the advantages of spending more initially depending on your own circumstance or situation. We've had several customers in the past who were in temporary offices for short periods of time. They wanted to quickly cover the floors of their offices with something new, clean and smart but still in the right colour to fit in with their corporate colours or décor of their interior. This is where paying extra for a nylon tile could be money wasted unless you are prepared to lift the tiles again and take them with you when you move. In this case, we recommend our Fjord Blue or Quartz Grey carpet tiles as although they are a 100% polypropylene tile they are made from a special spun poly fibre giving them a good castor rating and represent excellent value for money. From all the conversations we have had in the past, when the word 'industrial' is used in a carpet tile sense, it is more of a descriptive term of what is expected from a tile on a performance related scale. Prospective buyers want to know that whatever tile they decide to purchase they will actually work and last in their own environment. So, without getting bogged down in specifications, the long and short of it is that less fibre goes into making a 'domestic' grade carpet tile as opposed to an 'industrial' one. Manufacturers understand that every application is different and clearly there is a massive difference in what is required from a wear point of view in carpet tiles being laid in the home or being fitted in an industrial situation. Depending on where they will be used they will make their carpet tile ranges based on these two categories. It's definitely worth mentioning that we only stock the industrial type carpet tiles, however, you can still use the industrial carpet tiles in a domestic setting just not the other way round. In the workplace there will obviously be a marked increase in footfall and traffic combined with the use of industrial equipment meaning that a tile has to be up to the job from the word go and fit for purpose so when buying from other companies you have to bear this in mind if they stock both domestic carpet tiles and industrial grades. Understanding the different types of fibre that go into making a carpet tile will come into play more when considering using this floor covering in the workplace (as already mentioned above). With each rise in quality, the price will inevitably increase a few pence per tile however you can generally expect to get a better grade carpet tile for your money. You are then left working out which will work best, polypropylene or nylon and again this topic has already been covered in previous paragraphs. All the carpet tiles we sell on our website are first quality regular products. These are topped up constantly meaning they are nearly always available or on the rare occasion they are not, we will have more on order at the factory and will be due in very soon. Using regular carpet tiles can prove particularly useful if you are looking to do your project or refurbishment work in stages or over a period of time. We buy in huge quantities direct from the manufacturers so we are able to offer heavily discounted industrial tiles which will be perfect to use in all areas whether it be the factory floor, store, showroom, office or a meeting room. With all this information you will now need to choose what carpet tile will work for you. As we are a carpet tile wholesaler we do not provide a fitting service and everything we do is on a supply only basis. You will need to source a fitter or contractor to carry out the laying of the tiles if you are too busy to do this yourself. Putting carpet tiles down in a business situation can be a little more complicated and time-consuming than when doing so at home. This is due to the larger areas involved and the possibility of multiple doorways leading off a corridor, main entrance or reception area. If you are confident enough to carry out this work yourself then we have a very useful fitting guide on our site which shows you what to do every step of the way. Don't forget that before laying new tiles a little floor preparation may be required although this is dependant on what was down before. Then there is the staircase (if you have one) and you will need to work out whether you want to run the carpet tiles up these as well. You will need to install a proper stair nosing if you do decide to put carpet tiles on a flight of stairs. They have to be safe for staff members and the public making sure there are no potential trip hazards. Unlike rolled carpet in the home which can simply flow straight from top to bottom a stair nosing ensures enhanced safety and grip are constantly maintained whether wet or dry. We do not supply stair treads or nosings but can assist you in sourcing directly from the manufacturer (please ask us for further details). All that's left now is to choose your carpet tile and how many you need to cover your area. Most customers will initially choose by colour or at least have one in mind and then comes price, quality, situation, application and finally availability. Use our free, handy carpet tile calculator to determine how many tiles you need. Sometimes samples will be asked for prior to ordering but clearly, this will depend on the time frame. Many businesses or contractors looking for next day delivery do not have time to wait for samples to arrive even though most get there within 24 hours of them being requested. The colours on our site are a pretty good representation of the actual real-life colour. Viewing on electrical devices, unfortunately, can never be replicated and if it's colour critical then please always ask for a free sample to be sent first. We have sold to every business imaginable over the last 10 years and can offer great advice and insight on what will suit your certain area best. We understand the conundrum of carpet tiles from industrial to office to commercial. No matter if you are already experienced in flooring or a complete novice we will try to make sense of it all and make sure you choose the correct carpet tiles for the best possible price. So if you need any help in deciding which carpet tile is right for you then please do not hesitate to call.